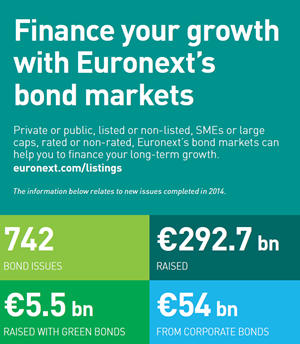 Euronext offers you a large and diversified range of products . The list below is not exhaustive. For more information, please contact us. A standalone bond issue is carried out independently. The issuer thus achieves a financing transaction in one shot. The issuance is not integrated into a program unlike in the case of a Medium Term Notes program for example. It is relevant for a non-recurring need. EMTN is a flexible medium-term debt instrument that is issued and traded outside of Canada and the United States. EMTNs are issued directly to the market with maturities of less than five years and are offered continuously rather than all at once like a bond issue. EMTNs make it easier for issuers to enter into foreign markets for capital. With EMTNs, the issuer maintains a standardised document (known as a program) that can be transferred across all issues and has a great proportion of sales through a syndication of pre-selected buyers. IBO – Initial Bond Offering Through issuing retail bonds, issuers are able to tap into a new source of funding or diversify into a new pool of retail liquidity. A retail bond can either be an alternative source of funding or complement existing channels: private placement, bank lending and the wholesale debt capital markets. The RBO offers greater flexibility for issuers as the size of a retail bond can be tailored to meet issuers’ particular needs and also helps to provide essential liquidity to investors since retail bonds can be traded like shares. IBO - Initial Bond Offering is part of the retail bonds product range and has been developed for small and medium-size companies, listed or not. The IBO can be listed on a regulated market (Euronext) or organised market (Euronext Growth). This financial product mirrors the IPO (Initial Public Offering). European Private Placements Bond, built on the USPP model. Created to make financing easier for small and midsize companies, listed or not listed. Unless a Eurobond, the required documentation is negotiated between the issuer and investors. This product is not made to be traded but rather to be held by investors until maturity. This market took off in 2012 (first EURO PP issued by Bonduelle). For this type of products, investors are mostly insurance companies. Based on the two main credit rating agencies, high-yield bonds carry a rating below 'BBB' from S&P, and below 'BAA' from Moody's. Bonds with ratings at or above these levels are considered investment grade. This type of bonds are made for small and midsize companies and allow them to access market financing. Euronext is pleased to support cross-border activity of corporates and serve the wide range of bank services offered in foreign currencies (deposits and loans, trade finance, cross-border transfers, FX Offer, etc.). Multicurrency bonds can contain options that grant the creditor and/or the debtor the right to call the bond early. This enables the exchange rate risk associated with the subscription or issue to be limited. Euronext offers a large variety of structured products such as ABS, RMBS, Cover bonds, Securitized products,… to meet the need of sophisticated issuers and investors.